We were recently at an industry trade show, and found some startling, and kind of disturbing news. We here at Athletic Seating pride ourselves on giving schools and teams, the finest Logo Chairs and Stools that you can get. Quality manufacturing, and quality logo printing. We proudly are a Hussey dealer, and we strongly advise any team or school to research and compare the Hussey line of Logo Folding Chairs and Stools, to the “other” brand you might have seen advertised or sold by numerous other dealers on line. Those chairs are made in China, imported here, and advertised to be “as good” as the name brand folding chairs and sideline chairs we sell. Yes, they are a little cheaper in price, and much cheaper in quality…..but now they’ve even outdone themselves in cost cutting and quality cutting.The Logos are now just a decal! They dont even screen print your team’s logo on the vinyl anymore. Imagine how disappointed your team will be when you receive these! And imagine how long these will last? Those decals can come off very quickly and easily….is that what you want to have on your team’s bench or locker room?….I doubt it! The Sideline Chairs and Stools aren’t cheap, your team or school spends alot of money on them….get the ones you wont regret purchasing. Athletic Seating does state of the art silk screen printing directly on the vinyl…with our exclusive process. The logo printing will last for the life of the chair, not until someone decides to peel off your teams name!!!! 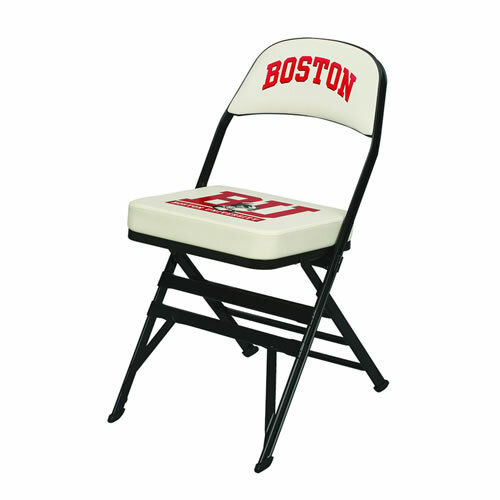 Don’t make a mistake if your school or team needs Logo Chairs….give us a call.